We will never be able to eradicate hunger. But as human beings, it is our duty to ensure that no one goes hungry. -Members of the Indian American Council volunteer to sort and pack food items. Raj and Aradhana “Anna” Asava were shocked when they first learned in 2014 that some schoolchildren in North Texas struggled with hunger on the weekends, when school meals are not available. They also found it hard to believe how many of their neighbors reportedly struggled with hunger and homelessness. At lunch with Harry LaRosiliere, mayor of Plano, Texas, Raj Asava learned about some of the initiatives at the North Texas Food Bank targeting school children, he recalled. The conversation encouraged the Asavas, who are retired from corporate jobs, to volunteer for the food bank and start a campaign called "Million Meals March" with a goal of raising funds for 1 million meals. “Hunger — whether it’s in India, U.S., or anywhere in the world — hunger should not be an issue in this day and age,” Anna Asava said. According to the Department of Agriculture, Texas ranks 17th in the U.S. when it comes to food insecurity, with 14.3 percent of households reporting either low or very low food security from 2014 to 2016. And in a 2016 study that analyzed federal government data, nonprofit Feeding America found that about 4,277,540 people in the state of Texas struggled with hunger, 1 in 4 of which were children. Raj Patel, a professor at the University of Texas at Austin who studies the world food system, said approximately 40 million Americans experience food insecurity, meaning they reported “reduced quality, variety, or desirability of diet” or “disrupted eating patterns and reduced food intake,” according to the USDA. “Hunger has long been a serious and largely unspoken problem in the US for decades, and it got substantially worse with the crash in 2007, when the number of food insecure Americans went from around 35 million to near 50 million. Under the Obama presidency, that number fell and we now have figures of around 41 million,” Patel said by email. 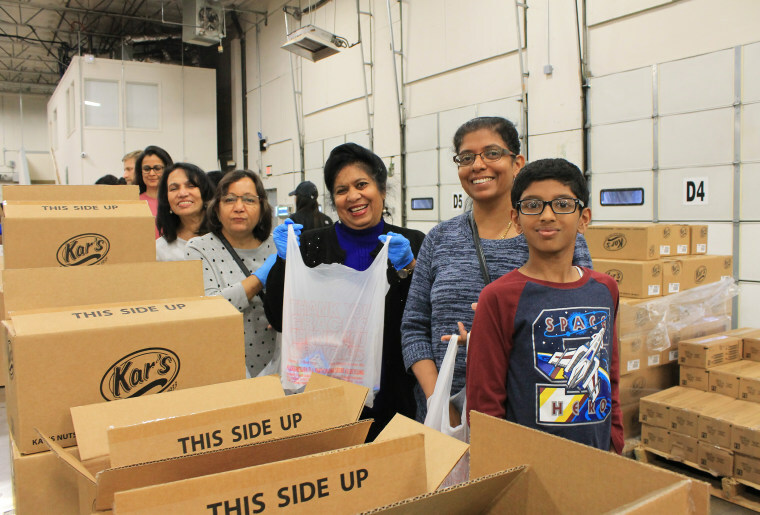 To help involve the Indian-American community in their efforts, the Asavas in 2017 co-founded the Indian American Council at North Texas Food Bank. The couple also launched their volunteer campaign with a slogan partly in Hindi, “Hunger Mitao!,” which translates to “wipe out hunger.” To gain some traction, they wrote a check for $100,000 to benefit the campaign. In seven months, the group has helped the food bank surpass their goal of funding one million meals, through a mix of cash fundraising, food donations, and volunteering, the Asavas said. One dollar provides approximately three meals, according to Anna Asava, and the council’s goal is to help expand the 70 million meals a year the food bank currently provides to 92 million by 2025. 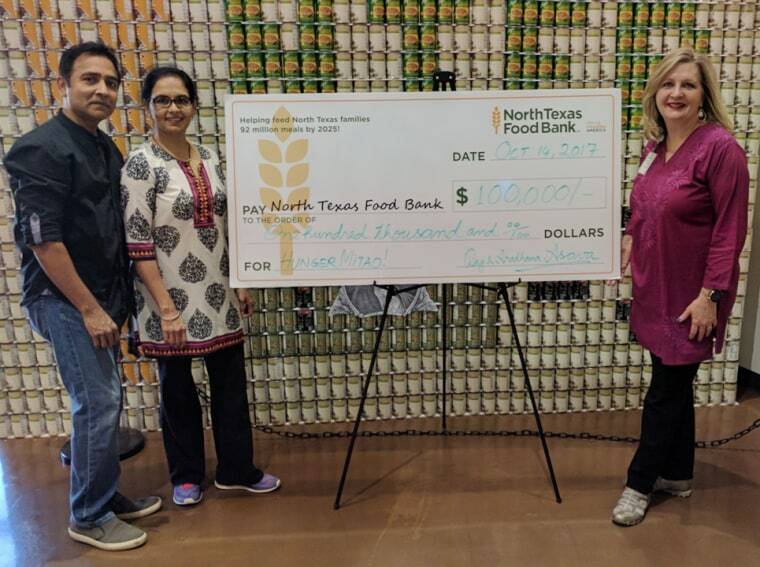 Raj and Anna Asava contributed the initial funds and launched the Indian American Council to help North Texas Food Bank. The council is collaborating with Indian-American associations and promoting the campaign through social media, radio, print, and flyers. The Asavas have hosted information sessions about the group's efforts at friend’s homes, faith-based organizations, Diwali parties, and other venues to encourage those in the community to participate in food drives. The Asavas' hope for the campaign is twofold: They hope it helps people who may need assistance — including Indian Americans — as well as get people to start talking about the issue of hunger. “Indian American community members are now visibly engaged and have made possible hundreds of thousands of meals for our food challenged neighbors across North Texas,” said Raj Asava. “We need to become visible on the front lines, we need to be seen as participants in the wider community,” Anna Asava added. The Asavas hope to expand their efforts to other communities and regions. Recently, Raj Asava worked with a Chinese-American colleague who was intrigued by how the Texas Indian-American community has rallied around hunger. The couple believe that the idea behind Indian American Council speaks to the immigrant spirit and resilience of the Asian-American community. When the travel, they frequently visit food banks to explain their model.